For many years, cable and satellite television services have been viewed almost as a utility akin to electric, water or telephone service – as an essential. However, recent trends toward cord cutting – the discontinuation of cable service – and cord shaving – changing to smaller and less expensive television packages – is dramatically changing how television content is viewed and the corresponding advertising opportunities. 72% of current customers feel their cable provider engages in predatory practices and takes advantage of consumers’ lack of choice. The second driver is the surge in alternative providers of video content available through consumers’ internet connections, which has been fueled by broadband penetration which has now reached 79 percent in the US according to Leichtman Research Group. Most popular among these are video on demand providers Netflix (which just reported its best quarter ever, adding 4.3 million subscribers in Q4 of 2014), Hulu Plus and Amazon Instant Video, each of which provides a huge amount of syndicated content at a relatively low cost. Included within these subscriptions is a growing amount of original content not available through traditional television channels. And most recently, Dish Network announced its new web-based Sling service which will provide a small number of the most popular networks for only $20 per month with the option to add on targeted modules such as children’s networks. Most notably this new service will include the ESPN channels, challenging the last stronghold of the traditional distributors, real time sports coverage. The third driver is a fundamental change in how television content is consumed. For most of its history the serial nature of television programming led to viewers scheduling their calendar around their favorite programs. But with each improvement in time shifting technology, from VCR to DVR, there has been a movement to fitting television around other items on their calendar. Now the broad availability of video enabled mobile devices such as smart phones and tablets is growing a sentiment of IWWIWWIWI – I Want What I Want When I Want It. This is giving a tailwind to streaming video providers who not only give access to all these devices, but also provide on demand access to complete archives of programs. 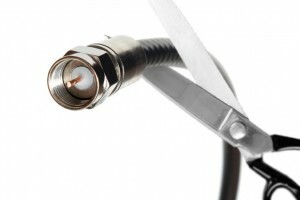 Evidence of the cord cutting trend is a 16% increase from 2012 to 2014 in the number of U.S. households that purchase broadband service but not cable television according to SNL Kagan. But regardless of whether consumers are cutting the cord, shaving the cord, or just supplementing cable offerings with streaming video, the upshot is that substantial video viewing time is migrating to internet-based platforms. 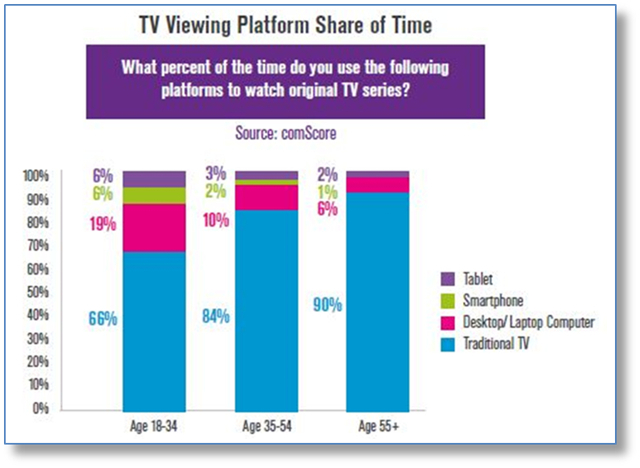 Not surprisingly, the group leading the move away from cable television is Millennials. A comScore study reported that “18-34 year olds are 77 percent more likely than average to be a cord-never household… and 67% more likely than average to be a cord-cutter household.” So to better target this attractive but relatively hard to reach demographic, savvy advertisers are diversifying their media mix to include video advertising on the online platforms that Millennials increasingly frequent. While many of the paid subscription video-on-demand services such as Netflix and Amazon do not carry advertising, most other online streaming alternatives to the cable cord are ad supported. These include Hulu and Hulu Plus, YouTube, Crackle and network sites like CBS.com. 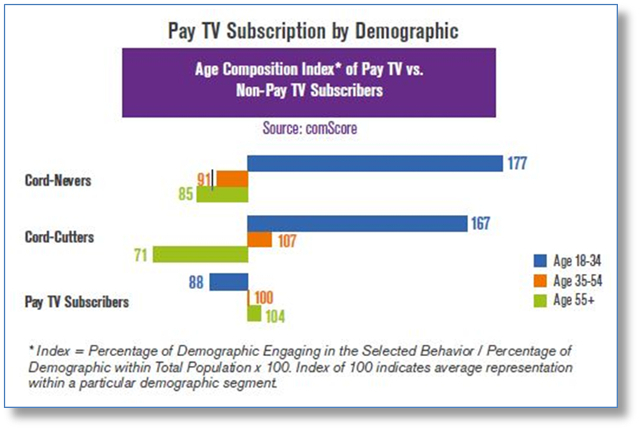 Given that one of the major motivating factors in cutting the cord is the cost of cable, it is likely that most viewers fleeing the grip of the cable companies are willing to engage with the advertising to realize the cost savings afforded by on-line viewing. And many providers are experimenting with ways to make the advertising served as relevant as possible. For example on Hulu users can tailor the types of ads they are served by completing an online survey of category usage. Another Hulu capability allows viewers to swap ads in real time. Advertisers who combine digital video with television in their media mix can significantly boost the reach of their campaigns, particularly among younger viewers who have cut the cord or just prefer accessing television content online. In fact, a comScore study of ten cross-platform campaigns found that on average, television reached 49 percent of the population while digital platforms uniquely contributed an incremental 5.8 percent to overall reach. While cord cutters can be reached through online advertising, some may question whether video ads embedded in online content can be as effective as advertising viewed on television. After all, television has a long and well documented history of delivering sales and strong ROI to advertisers. While some internet-based video viewing occurs on television sets using devices such as Roku or Apple TV, much of this viewing occurs on the smaller screens of computers, tablets or even smartphones for which the viewing experience may differ. To investigate whether any differences exist in relative advertising effectiveness for video ads viewed online versus on TV, MSW●ARS undertook a large scale experiment. Specifically, we tested the same video ads in two different ways among separate samples of consumers: as television ads viewed on standard television screens, and as pre-roll ads viewed online prior to short-form video. This study encompassed tests of 30 different ads for 15 different brands. MSW●ARS’s sales-validated CCPersuasion™ and Related Recall™ metrics were used to evaluate the effectiveness of the advertising tested in each of these two environments. The results were highly correlated for both metrics, as can be seen in the charts below. This suggests that an ad that is effective when viewed on television is also highly likely to work well in an online video format – what works creatively on the television screen will translate to the online viewing environment. It also suggests that video advertising on digital platforms can be as effective as advertising on television, perhaps even more so when digital techniques to improve relevancy are employed (these techniques were not examined in the experiment). So, advertisers can turn the cord cutting phenomenon to their advantage by following this audience online. And many are already doing so. According to a recent comScore study, advertising already comprises 15.8 percent of online viewing time of premium (long-form) video. This represents two thirds of the comparable percent for television (23.3 percent). These advertisers are using online video to improve upon TV-only reach levels – especially among the younger demographic – and can be confident it will move the sales-needle as expected. Furthermore, they will get a leg up on the competition in terms of building equity among Millennials, while those who fail to follow suit risk losing the next generation to competitors. With the unique TouchPoint™ system for testing advertising’s effectiveness on any media platform – including online video – and the patented outlook media planner for optimizing media spend, MSW●ARS has the tools to help advertisers capitalize on the changing media environment and turn the cord cutting trend into an advantage. Please contact your MSW●ARS representative to find out more about how we can help your brand evaluate and optimize online video advertising as well as other touchpoints in your media mix. Tailored Digital Ads – They Know Where You Live! What is the Return on Your Tracking Investment?